The Frontera 30th Anniversary Celebration at The Art Institute of Chicago April 30 drew more than 700 attendees — and generated more than $100,000 in proceeds for FamilyFarmed and Chef Rick Bayless‘ Frontera Farmer Foundation to expand their efforts to help Midwestern small farmers and food entrepreneurs. The big draw was an epic tasting party, featuring culinary magic from more than a dozen world-class chefs, to commemorate the opening of Rick’s landmark Frontera Grill in 1987. 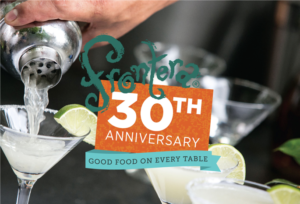 It was a bit of a gamble for the Frontera 30 team to precede the Celebration with The Good Food Forum: A Bold Vision for the Future of Food. Given that most in the audience were anxious to eat, drink and be merry, the hour-long symposium could have be a buzzkill. But it was quite the opposite. 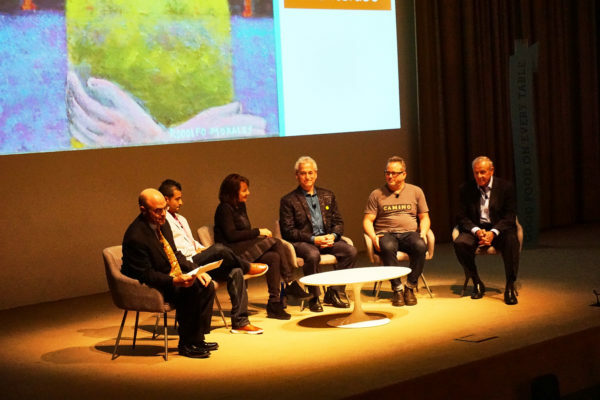 The enlightening, engaging and passionate discussion among five Good Food activists and leaders was deftly moderated by Peter Sagal of NPR’s popular program “Wait, Wait… Don’t Tell Me.” And it turned out to be a perfect set-up for the food and frivolity that followed. The organizers received positive feedback from multiple attendees, who said the Good Food Forum put into context the issues addressed by Frontera Farmer Foundation and FamilyFarmed. They said it left them with a greater understanding about what needs to be done to create a better food system in the United States, one that is healthier, more environmentally sustainable and more economically dynamic. Their discussion followed an inspiring keynote address by Rick Bayless, which is covered in an article published on Good Food on Every Table on May 2 (click here). This site also ran a colorful photo essay of all of the world-class chefs who participated in the event’s “All-Star Culinary Food Court,” published May 3 (click here) and an overview of the whole event published May 4 (click here). 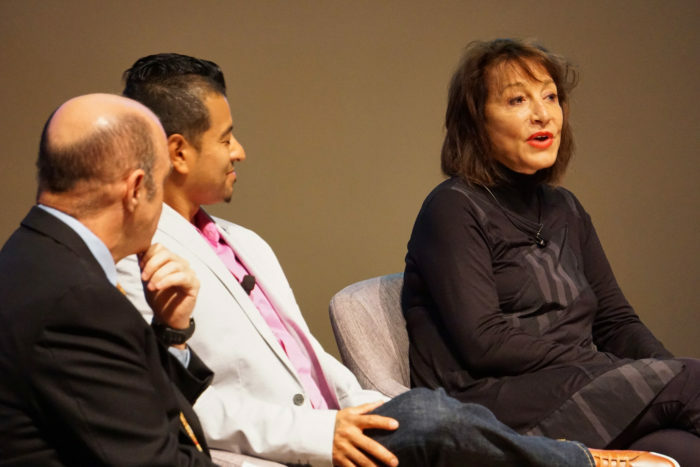 The following is an excepted transcript of The Good Food Forum panel discussion. 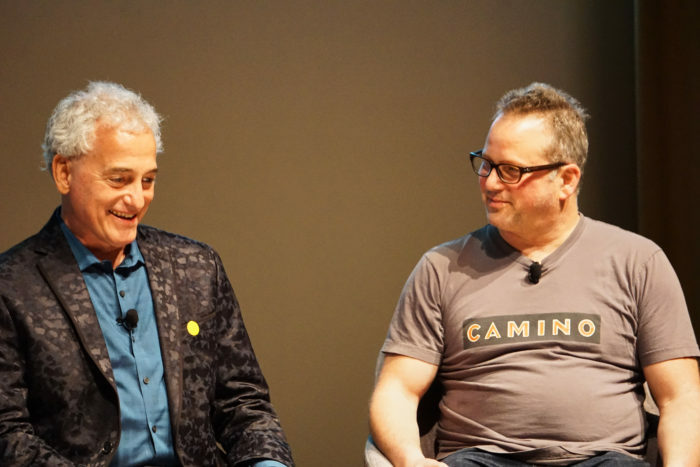 Peter Sagal: We figured we’d focus on, if you will, in your remarkable and varied careers, the one thing you’ve done that you feel most proud of, and has had the most effect on advancing the Good Food movement. Eduardo, I’ll start with you. Eduardo Rivera: I guess the thing I’m most proud of is going back to my roots and start my own farm as a person of color. You don’t see very many farmers owning their own business or event their own land, so for me that’s been a big achievement, farming in general…. Nora Pouillon: The thing I’m proudest of is that I started, in the ’70s, to really go back to clean wholesome food, and I went all over the country to find farmers that were growing that kind of food that I was accustomed to. I’m from Austria, if you haven’t detected that from my accent… All this time I was going to find more and more farmers to grow and raise food in a more sustainable way, mainly organically. And then I decided to become certified organic, and I really had to work hard to find someone to do that. It’s lots of paperwork, it takes money. But it was important to show my customers that they can trust me… So in 1999, it took two years I became the first certified organic restaurant in the country and I’m happy I did that. 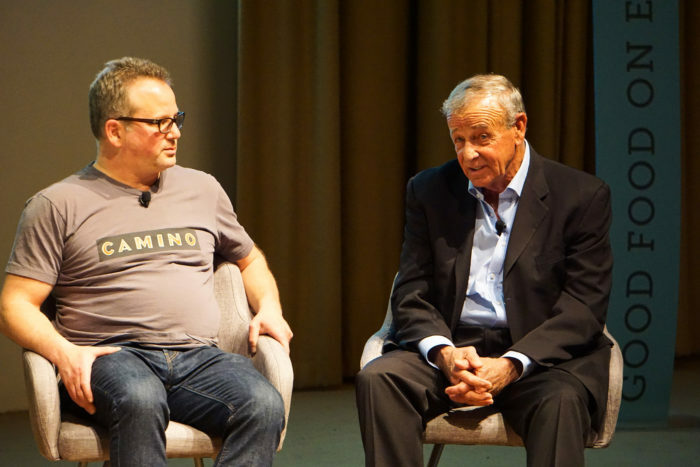 Jim Slama: Actually, recognizing [in 2004] that there was no trade show in the natural and organic local food industry, and there needed to be. Starting it was a huge thing… And since then, we’ve really helped to create markets for local sustainable farmers… We’ve helped with many larger scale buyers to connect them with local farmers, local producers and help them get that local food, help them scale up. Simultaneously, we realized eight years ago that there’s double-digit growth in the local and organic food industry for 30 years, and with that kind of growth businesses need financing, they need capital… So we launched a financing conference [in 2009]… Since then, lots of businesses have pitched, many of them have been financed. We launched our Good Food Accelerator at 1871 [Chicago’s leading business incubator]. Businesses have raised $36 million. And there are real deals happening across the Good Food spectrum that our staff are helping to contribute to, and with your support, they’re going to continue and we’re going to grow this market. Paul Kahan: I guess my case is one of being in the right place at the right time. A lot of what Rick talked about in the beginning are things that I was kind of along for the ride. I was fortunate to work for Rick and Deann [Rick’s wife] early on at Topolobampo and sort of had the right DNA instilled in me. Before I worked for Rick I worked for this guy named Erwin Dreschler, and he used to take me to that Lincoln Park farmers market. I never really knew a different way to cook and to shop and to run a restaurant than that. Peter Sagal: Is there anything you haven’t done yet that you want to do or something you weren’t able to do that in some way would push this culture, this cause. Fedele Bauccio: One is that 80 percent of what we put into our bodies and what we buy in terms of protein is loaded with non-therapeutic antibiotics, and we’ve got to stop that… The only way we’re going to do something about this is for you to go in the grocery store and ask the right questions and look at the local ranchers and try to understand how they raised their animals. Because we have antibiotic resistance in this country, and when we’re sick, we’re going to have a problem. Peter Sagal: Let me come back to Eduardo. I was reading an interview with you where you were saying you were going into Latino markets in the Twin Cities and you couldn’t convince them to buy your produce because it was more expensive… What are we going to do about that? Peter Sagal: Nora, I know you’re in an interesting position because you’re in the process of closing your restaurant or at least trying to find, let’s say retiring from it. What are you going to do next? Peter Sagal: Jim, since you’re the guy who’s most directly involved in making Good Food, sustainable food an ongoing business, what is your take on this consistent issue, that Good Food costs more money and you have to convince people to pay more money for it? One of the reasons we’re starting the Good Food is Good Medicine program with Northwestern, we want to teach people in all communities across Chicago… about the connections between eating well, good nutrition and good health. I think there’s a lot of opportunities for all of these things. Peter Sagal: Paul, one of the things that you do is the Pilot Light Foundation where you’re doing educational programs in schools. That brings up a thing I think a lot about, which is Chicago is very big city with a lot of diverse experiences. Paul Kahan: We’ve had incredible success working with the teachers on a food-based curriculum that relates to everything that the children study in school: math, science, social studies…We started out with 60 kids and then it’s 180 kids and then it’s 10,000 kids, and we’ve just seen it grow and the children’s excitement, the question they ask. Ultimately we believe we can touch a large portion of the Chicago Public Schools system… It teaches people compassion, it teaches people, when kids learn about other cultures, I think racism will disappear or start to disappear. Food is a tool to fix everything that’s wrong. Peter Sagal: I was asked by the Frontera Foundation to keep this light and optimistic so, my last question, what would your last meal be? Fedele Bauccio: I’d have to say a roast chicken… with no antibiotics and was free-range, running around a field. Yes, I’d like a roast chicken. Jim Slama: A Gunthorp [Farms] pig roast in my backyard… if I’m doing a final meal, I want to do it with 100 of my favorite friends and amazing Good Food. Nora Pouillon: I think it would be a simple roast chicken with garlic and lemon and rosemary and probably really delicious tomatoes, maybe with some burrata and Austrian toasted pumpkin seed oil. Eduardo Rivera: For me, it would have to be my mother’s meal that makes for me every time I see her, which in Mexico it would be green chili with pork, wild potatoes and homemade flour tortillas. This entry was posted in Chef activism, Chef advocacy, Direct Farm Marketing, Family Farms, Farm businesses, Farm to table dining, Food activism, Food Entrepreneurs, Frontera 30th Anniversary Celebration, Frontera Farmer Foundation, Good Food Dining, Good Food movement diversity, Good Food restaurant trends, Good Food Success Stories, Local Food, Organic farming, Restaurants and Good Food, Small Farmers, Sustainable dining and tagged Bon Appetit Management Company, Chef Rick Bayless, Eduardo Rivera, FamilyFarmed, Fedele Bauccio, Food Entrepreneurs, Frontera 30th Anniversary Celebration, Frontera Farmer Foundation, Frontera Grill, Gunthorp Farms, Jim Slama, Local food sourcing, Nora Pouillon, NPR, One Off Hospitality, Paul Kahan, Peter Sagal, Pilot Light Chefs, Restaurant Nora, Sin Fronteras farm Minnesota, small farmers, The Art Institute of Chicago, Wait Wait Don't Tell Me. Bookmark the permalink.